Patience is a virtue as they say. These beautiful green leaf tea pearls are hand rolled and placed beneath August Jasmine bloom, absorbing its magical scent. The process is repeated several times with fresh flowers to enhance the wonderful fragrant flavour, ensuring this is some of the best Jasmine tea you'll ever, ever have. A real treat for all jasmine lovers. Did you taste our Microlot Teas? Product : The green tea itself is pricey but worth every penny in my opinion. 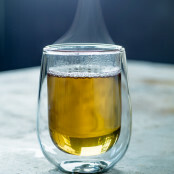 This green tea can be very strong if left to long in the pot but that could be a good thing if you like you're green tea like that. Service rating : Efficient ordering and prompt processing and delivery. Tea is flavoursome. Package delivered as promised. Tea is always delicious and very fresh - thanks! You fulfilled what was offered on time. Product looks okay, packaging adequate and delivery on time. Only downside, I do feel it is very very expensive.